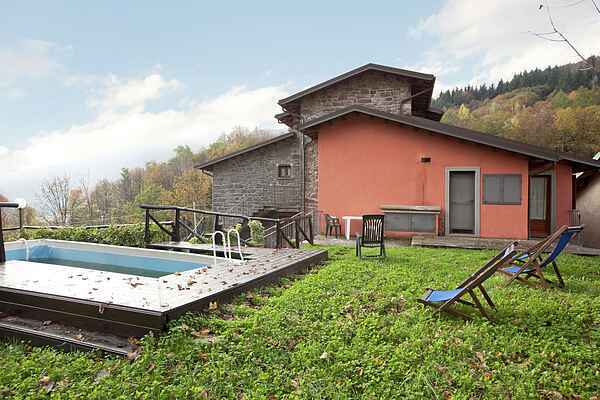 Il Balzone consists of a few apartments spread throughout this former farm property. There are 2 stylish appartments, on the ground floor and on the first floor. The appartments are not on one level but the rooms are connected via a few stairs. The house has a small garden. The surroundings are ideal for mountain hikes, in the midst of woods and countless streams. From the accommodation you can enjoy a spectacular view on the landscape. The house is finely furnished in a rustic style and features a beautiful open fireplace in the relaxing living room. The 80 m2 property has a private entrance and is located on the ground floor. There is a 1500 m gravel road leading to the house. Pian degli Ontani is a typical, peaceful countryside town - ideal for those who want to spend a tranquil holiday, far from the city hassle. In winter you will be charmed by the beauty of the snowy landscape and the possibility to do sports like (cross-country) skiing, snowshoeing or snowboarding. In summer you will be immersed in the greenery and be able to enjoy activities like trekking, mountain biking, orienteering, rock climbing, hunting, fishing, horseriding, hiking along the Sestaione river, or sports like football and tennis. In the surroundings you can practice down hilling, rafting and rail bobsledding, as well as spend some time in an adventure park. You can also go berry (raspberry, blackberry and blueberry) or mushroom picking. During your stay you could spend your time visiting some of the most important Tuscan cities such as Pistoia (37 km) which has been declared the Capital of culture. Lucca (55 km) iis famouse for its ancient walls e for its typical streets, amazing to explore. Also Pisa, little bit further, is worh a visit with its leaning tower (Torre pendente) and the beautiful Piazza dei miracoli with the Cathedral and the Baptistery. Last but not least Florence (78 km away), capital of Tuscan, the city is rich of culture and art with a lot of museums, churches and ancient palaces. You can’t miss it!